1. 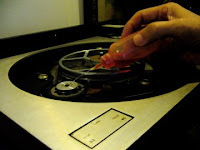 Remove the motor from the board and place it onto a stainless steel isolation base,IB22, to isolate the motor vibration such that the motor now effectively becomes an "out-board" motor (refer to my earlier post on motor isolation base for Rega P1 ( P2,P3) for details). 2. 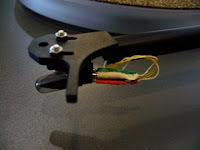 Replace the original Rega RB100 tonearm wires with new ones (end-to-end without joints as the origin Rega wires are joined at the tonearm base and arm tube), and also provide separate earth wire to solve the humming problem associate with using the moving-iron (MI) Grado cartridges as the Rega RB100 uses one of the negative wire as earth. 1. Upgrade plastic end-stub and counterweight to stainless steel underslung counterweight. 2. 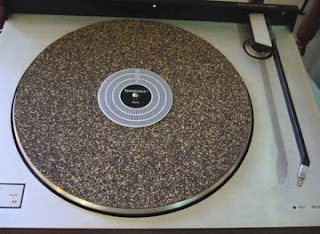 Change the resin sub-platter to anti-resonance aluminium metal sub-platter. 3. Replace the wooden fiber platter to acrylic platter with lower centre of gravity. 4. 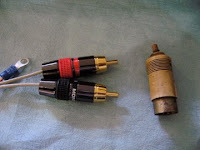 Upgrade the Ortofon stylus to OM30e. 1. Fix the motor onto the motor isolation base (reversible). 2. 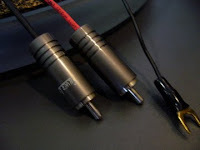 Upgrade tonearm wires with separate earth ( non-reversible ). 1. Upgrade the plastic pulley to stainless steel pulley. 2. Add a 3-point stainless steel VTA spacer. If you are not upgrading your Rega P1 to higher series yet at the moment, have some fun tweaking what you have in hand. Moreover, most of the upgrades are transferable to more expensive Rega models should you decide to upgrade your humble P1 in the future, i.e. to P3-24 or P5. 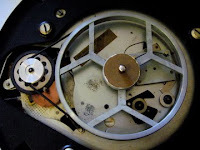 This is something I always like about Rega- simple, upgradeable and 'timeless'. 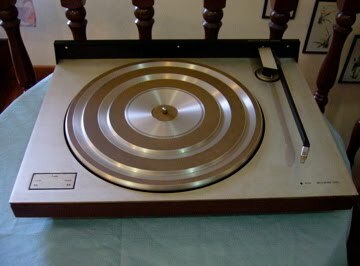 Today I am in the mood to try on the preowned Bang & Olufsen ( circa 1970's) vintage belt-drive turntable, Beogram 3400, which I chanced upon in the local flea market some time ago. A very well-designed, elegant looking so-called 'sprung' turntable, the main bearing and the tonearm of Beogram 3400 are mounted on a sub-chassis suspended on three springs to isolate it from most interferences. 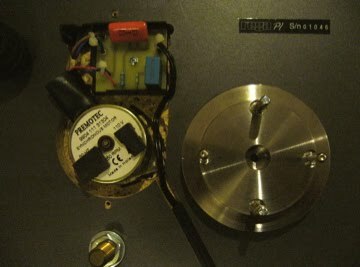 The motor assembly is also mounted on the sub-chassis, but with another three springs to prevent the motor vibrations from reaching the tonearm and the platter. 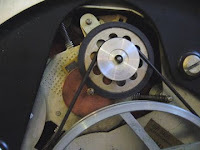 It is interesting to note that one of the spring that holds the motor even acts to counter-balance the push/pull force of the rubber belt, enabling the sub-chassis to centre itself easily. The sub-platter and platter are made of aluminium with strong anti-resonance patterns; the platter is further isolated from the sub-platter with three pieces of felt, 120 degrees apart at the bottom of the platter surface. All the pulleys are of metal type - brass and aluminium. The motor pulley drives an idler which turns the rubber belt to spin the sub-platter/platter combo. Combination of idler and belt reduces the motor vibration from reaching the rubber belt, hence the sub-platter. 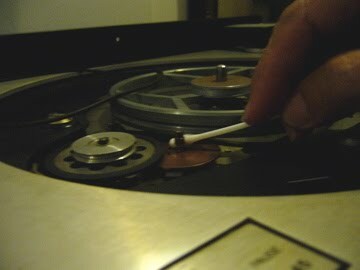 The 33.3 rpm and 45 rpm speeds are adjustable through eddy current effect ā la Thorens TD124. 1. The dented and corroded 5-pin Din plug to be changed to RCA plugs. 2. The rubber belt and the idler, both are still surprisingly in good conditions. 3. The main bearing and idler bush bearing are lubricated with light oil ( sparingly) and the metal pulley of the motor is cleaned with alcohol using a cotton bud . 4. Three pieces of 2 mm x 19 mm circular cork are added to isolate the platter from the sub-platter(the original felt isolators had already been fully compressed and lost the effective isolation property). 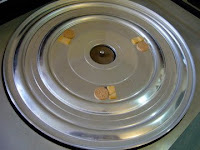 Moreover, the cork has 'anti-slip' property allowing effective energy transfer to platter. 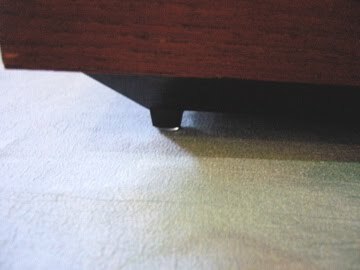 Another four pieces of 8 mm adhesive clear bumpers are also stuck on the bottoms of the turntable supports to reduce ground-borne interference. 5. The MMC20EN cartridge stylus is cleaned with stylus cleaning solution. 6. A Thorens rubber/cork mate is added to tame the platter resonance. Finally, with the AC power on, I check the speeds for both 33.3 rpm and 45 rpm. To my surprise it is quite easy to achieve the accurate speed desired. Amazing ....... ! It's still sounding so good after such a long hiatus ......!